Drop students off between 7:45 and 8:00 am. (Please do NOT drop students off before 7:45 unless you have special permission from Kirsten Cronlund). Walkers should arrive after 7:45 and not before. Drive slowly and watch for pedestrians . When dropping off students at Heilman Hall please pull close to the curb, and drive up as far as possible. Please allow students to exit on the passenger/curb side of vehicle ONLY! If you or a child must exit the vehicle on the driver’s side please pull around the island and park in a parking space for longer drop-off. Please set a good example for the students by crossing only at the crosswalk where the there is a crossing guard. The Pastor’s Office is not an entrance to the school. If you wish to enter the school, please use the main school entrance at the school office. Park so you can pull forward in order to avoid backing up. 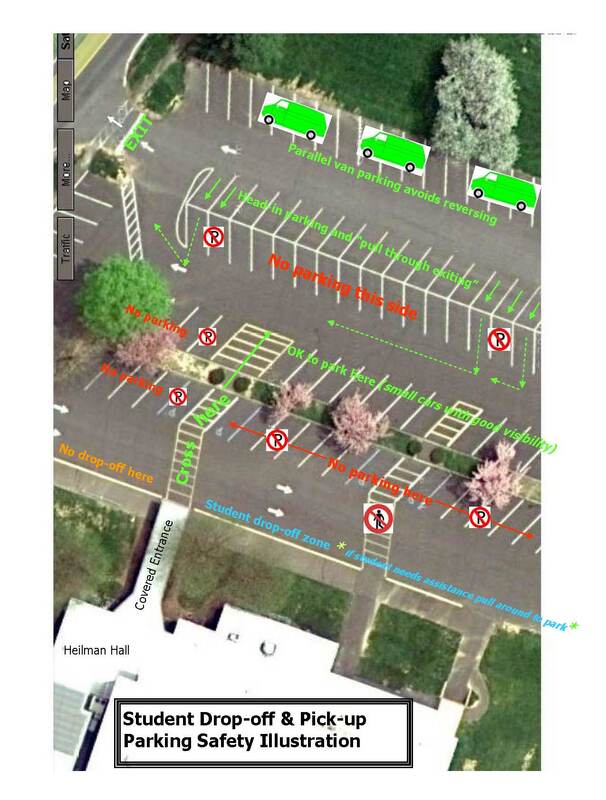 See parking chart below. Park in the middle lane on the far side of the island, head in so you can pull forward to exit (no backing up needed). No parking on the building side of the island. No parking on the far side of the island in the first 8 spaces to allow good visibility to children crossing from the crosswalk. (Smaller vehicles with good visibility may park against island further down and back-up carefully.